State of the Union: For financial markets, there wasn’t much in the speech that mattered. There was nothing on taxes and the potential for any major spending program is low. For the most part, these speeches have become a political spectacle that usually lack substance. However, there were two items of note that will bear watching. First, the president indicated that the U.S. will “never be a socialist nation.” Although there are some baby boomers attached to the term (Sen. Sanders perhaps the most notable), socialism has become a generational divide. Those old enough to have seen communism and socialism on a large scale are quite familiar with its failings. David Hume’s view that the only power that can offset self-interest is self-interest itself is perhaps one of the most radical insights into human behavior. Accordingly, for baby boomers, it is ludicrous to suggest that socialism is an idea whose time has come. So, other than the fact that history isn’t taught anymore, why the interest in socialism from millennials? One of the problems of socialism is that it tends to disadvantage capital. This tendency leads to underinvestment and, eventually, scarcity and inflation. Inflation trends likely explain the generational attitude toward socialism. 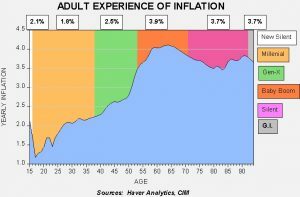 This chart shows the average experience of inflation from age 16 to the age on the X axis. In other words, a current 60-year-old’s experience spans from 1974 to 2018. The line on the chart shows the adult experience of inflation for each year listed on the X axis. We have calculated the average experience by generation. 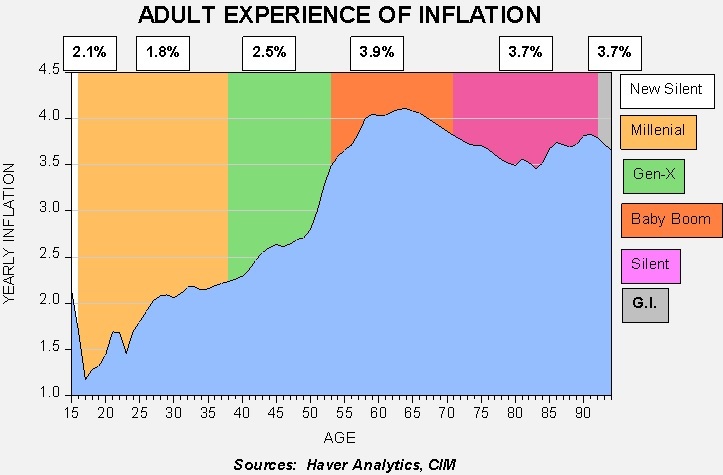 Baby boomers have the highest inflation experience, whereas millennials have the lowest. We would argue that the low inflation experience of millennials means that one of the key negatives to socialism, the tendency toward inflation, is less of an issue for that generation because it hasn’t experienced it. Instead, that generation has tended to focus more on inequality and slow growth. Politically, socialism could become a wedge issue that the GOP will use against the Democrats, especially against the left-wing populist constituency within that party. This could be an effective tool in the short run. However, demographics will become a problem for the GOP over time if it adopts opposition to socialism as a wedge issue. Second, the other note from the speech that caught our attention was the comment about no more “endless wars.” Endless wars are part of being the global hegemon because this role requires global military power projection (in part, the ability to project power globally is one element of how we define hegemony). The goal of the superpower is to limit interventions and avoid needless conflicts in areas that have little strategic importance. The U.S. has gotten itself into trouble on this issue when it lacks a clearly defined mission; once the goalpost moves from a specific aim to mission creep, e.g., “fostering democracy,” then the ability to limit involvement is undermined. So, on the one hand, the president has a good point: we should engage in conflicts with clear goals in mind. For example, if our goal in Afghanistan was to eliminate the country as a base of operations for al Qaeda and remove the Taliban from power, then we would have been out of the country a long time ago. But, once we are on the hook to transplant democracy, we could be there forever. On the other hand, there are some elements of hegemony that require a constant presence of American military power. Keeping peace in Europe to resolve the German problem and preventing militarism in Japan by securing the country’s trade routes require long-term commitments. It isn’t obvious that the president sees the difference. We have no quarrel with his goal of leaving Afghanistan or even Syria (although the shift to a build-up in Iraq doesn’t look like a good idea); leaving NATO, on the other hand, could be a serious mistake. Brexit: PM May is going to leave the Irish backstop in place in her agreement. She is negotiating with the EU to either limit the time that the backstop would be in place or adjust it to prevent the open border on the Irish frontier from keeping the U.K. in the EU Customs Union indefinitely. There is evidence that the DUP, her Unionist coalition partner, is flexible on this issue which is a good sign. Unfortunately, the hard Brexit groups within the Tories want no backstop at all which would likely lead to border controls on the Ireland/Northern Ireland border. Instead, this group wants new border technology (which doesn’t currently exist) to allow trade and people to move seamlessly across the frontier. Increasingly, it looks to us that May can either have (a) soft Brexit and break up the Tory Party, or (b) maintain Tory Party unity and hard Brexit. Although it’s hard to say how she will lean, our concern is that she will take option (b). OPEC and Russia: The cartel is seeking a formal arrangement with Russia that would, in effect, expand the cartel. Russia has some influence on some of the former Soviet states as well, which would broaden OPEC even further. Some producers within OPEC, such as Iran, oppose adding Russia for fear that cartel policy would effectively be set in Riyadh and Moscow. If OPEC were to expand to include Russia and other nations, its ability to move prices would be enhanced. The fact that the Saudis are even contemplating such an arrangement is a clear indication of waning U.S. influence in the Middle East. At the same time, we doubt Russia would be a reliable coalition partner. It has a history of breaking promises and would not likely adjust output in a way that would harm its national interests. If OPEC is able to bring Russia and aligned nations into its fold, it would tend to be bullish for oil prices. Another dove: Dallas FRB President Kaplan is staking out a clearly dovish position on monetary policy. In an interesting reversal from his predecessor, who tended to be persistently hawkish, Kaplan has indicated he wants “no further action on rates.” Although his openly dovish position is supportive of the idea that this tightening cycle may be over, it should be noted that he isn’t a voter this year. Trade talks: The U.S. negotiating team is off to Beijing next week. The presidents of the two nations haven’t agreed to a meeting yet; it appears that if such a meeting is held, it will likely be a signal that an agreement has been reached. We still expect a deal to be made, but not one that includes all the issues on technology that the U.S. wants. President Trump needs a deal with China to help his reelection effort. Increasing trade tensions with China would be a significantly negative factor for U.S. equities. Meanwhile, it appears the Europeans are slow-walking talks to run out the clock and avoid auto tariffs. Trade positions appear almost impossible to overcome; the U.S. wants open trade in agriculture which would upset the EU’s carefully negotiated Common Agricultural Policy. The EU wants open trade on industrial goods which the U.S. isn’t likely to give. The whole point of the Transatlantic Trade and Investment Partnership (TTIP) was designed to overcome these hurdles on a systemic basis. But, since it and the TPP have been shelved, we are back to talks with little hope of success. We suspect the Europeans may be hoping that Trump fails to win reelection and the pressure will be relieved. That will be true only if the Democrats (a) nominate an establishment candidate, and (b) that person wins. It is quite possible that the Democrats nominate a populist (e.g., Sen. Brown) who would be even tougher on trade than Trump. German industrial policy:Although the news will likely only excite the most wonky of analysts, Germany is creating a new industrial policy designed to support large industrial combinations to create national champions. Essentially, Germany wants the EU to support an anti-competitive industrial policy led mostly by Germany and France. One of the underlying assumptions in Berlin is that when the Germans say “EU” they really mean Berlin and Paris. It will be interesting to see if the EU will acquiesce to German policy goals or prevent such combinations to maintain competition.